Russia and Saudi Arabia have struck a deal to raise oil output from September through December to cool rising prices, the Reuters news agency reports. Sources familiar with the plan were quoted as saying on Oct. 3 that the Russian and Saudi energy ministers reached the agreement during a series of meetings last month. Benchmark Brent crude rose to $85 a barrel this week — up 27 percent this year — as buyers of Iranian crude wound down their purchases to meet the terms of upcoming U.S. sanctions on Teheran. The United States withdrew from the 2015 nuclear deal between Iran and world powers in May, and last month started reimposing sanctions on the Iranian economy that were lifted under the deal in exchange for curbs on Tehran’s nuclear program. A second round of penalties targeting Iran’s oil exports is due to come into effect in early November. Meanwhile, the U.S. administration has pressured other countries to cut their Iranian crude imports and called on the Organization of the Petroleum Exporting Countries (OPEC) to boost output to bring down fuel prices. But at a meeting in Algiers last month, OPEC members and other global producers, including Russia, declined to announce an immediate increase in production, a move opposed by Iran. 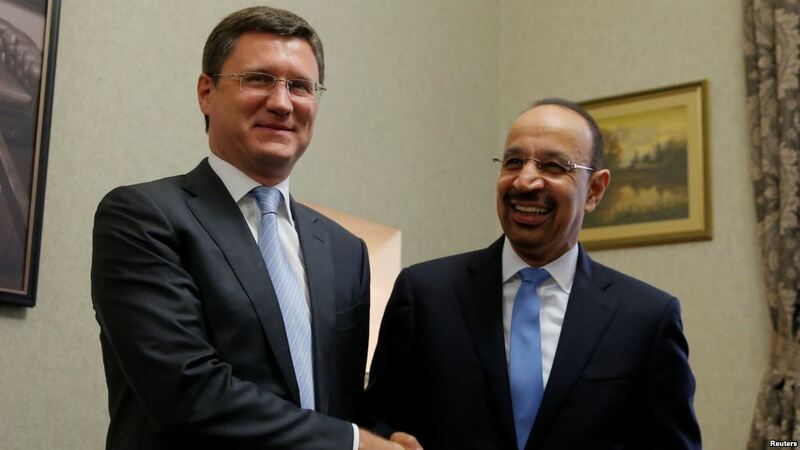 The Russian and Saudi energy ministers, Aleksandr Novak and Khalid al-Falih, “agreed to add barrels to the market quietly with a view not to look like they are acting on [U.S. President Donald] Trump’s order to pump more,” an unidentified source told Reuters. Perry was informed of the Saudi-Russia agreement to lift output ahead of the Algiers talks, meeting with Falih three times in September and Novak once, Reuters reported. Russian output rose 150,000 barrels per day (bpd) to 11.36 million bpd in September, according to Energy Ministry data. “I would expect Russia’s oil production will hover at around 11.4 million to 11.6 million bpd until the end of 2018 and may increase further to 11.8 million bpd later on in 2019,” a source at a major Russian oil company said. On Oct. 3, President Vladimir Putin said at Moscow’s Russian Energy Week that Russia “will be quite satisfied” with oil prices of $65-$75 a barrel. He also said that his country, which already broke its post-Soviet production record last month, could raise production by up to 300,000 bpd to tackle possible fuel shortages. “I anticipate that November will be slightly higher,” he also said, adding that state oil company Aramco will discuss November supply volumes with customers next week. The Saudi minister also said that Russia and Saudi Arabia were pumping an extra 1 million barrels a day of oil since June, and that the United Arab Emirates and Iraq had also pumped more. Meanwhile, Iran accused Saudi Arabia and Russia of breaking OPEC’s agreement on output cuts, and insisted that they could not produce enough oil to make up for a reduction in Iranian exports.